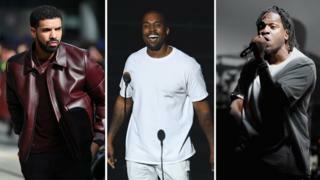 Drake has released a new track taking aim at both Kanye West and Pusha T.
The Toronto rapper was responding to lyrics on Pusha T's new album. "I could never have a Virgil in my circle and hold him back 'cause he makes me nervous", Drake says on Duppy Freestyle, referencing Kanye's long-time creative director Virgil Abloh, who's now head of menswear for Louis Vuitton. Drake also claims he's done things for Kanye "I thought he never would need". The lyrical beef between Pusha T and Drake goes back a few years, and appears to stem from a disagreement between King Push and Drake's one-time mentor Lil Wayne. Pusha T chose to reignite the row on his new album Daytona, which was produced by and features G.O.O.D. Music label head Kanye West. On its final track, Pusha accuses Drake of not writing his own lyrics: "The lyric pennin' equal the Trumps winnin'/The bigger question is how the Russians did it/It was written like Nas but it came from Quentin". The Virginia rapper appears to be suggesting that like an allegation against Donald Trump - that he had outsider help winning the presidency - Drake has help writing his lyrics. It's a theory that was first alleged by Meek Mill back in 2015, and one Drizzy appears to confirm (in part) on Duppy Freestyle. It took less than 24 hours for Drake to clap back - and fans were here for the quick turnaround. His response came with a number of cutting lyrics - but fans appreciated the track before he'd even started rapping. Drake questions Pusha T's famed drug dealing credentials, saying: "You might've sold some college kids some Nikes and Mercedes/But you act like you sold drugs for Escobar in the 80s". Pusha's current career was also questioned: "Don't push me when I'm in album mode/You're not even top five as far as your label talent goes/You send shots, well, I got to challenge those." Drake also refers to the person "that's making your beats" - AKA Kanye West - and says: "I've done things for him I thought that he never would need/Father had to stretch his hands out and get it from me." While he also referenced Lil Wayne and Birdman, who Pusha T dissed on Infrared, saying: "It's gonna be a cruel summer for you/I told Weezy and Baby 'I'ma done him for you'/Tell 'Ye we got an invoice coming to you/ Considering that we just sold another 20 for you." And Drake duly responded to Pusha's request - sending G.O.O.D. Music an invoice for "promotional assistance and career reviving". Pusha T spoke about Drake before his album was released, after snippets of Infrared were posted on social media. He told radio show Ebro In The Morning the lyrics were in response to Drake's Two Birds One Stone, in which Drizzy questioned whether Pusha T was as prolific a drug dealer as he claims. "The Drake thing, more recently, was about the Two Birds One Stone record," Pusha said. "A lot of talk about the record, or whatever the case may be... I guess, just speaking his truth, questioning my validity to the streets and so on and so forth within that verse. "It's fine. That's what it was. But if we're gonna question things, it's my turn to question." Drake is expected to release his next album, Scorpion, in June.